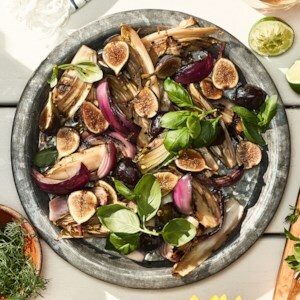 Find healthy, delicious potluck salad recipes, from the food and nutrition experts at EatingWell. 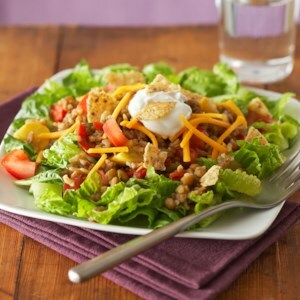 This gorgeous and colorful 8-layer taco salad recipe is made healthier by using ground turkey, Greek yogurt and lots of vegetables. 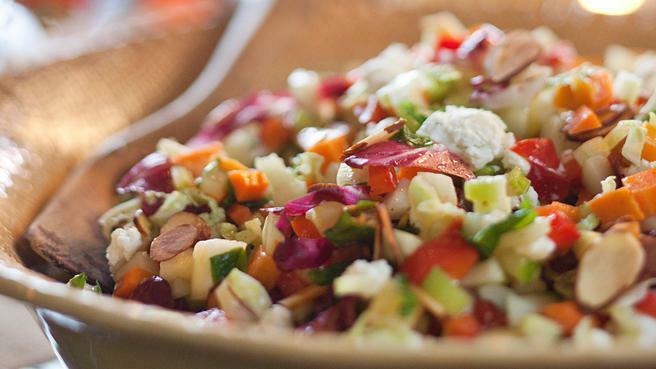 Chopped veggies, fruit, nuts and goat cheese come together for an impressive salad that's easy enough to make any day. This simple salad, topped with crunchy garlicky breadcrumbs, is the perfect vehicle to showcase a unique, colorful mix of tomatoes. 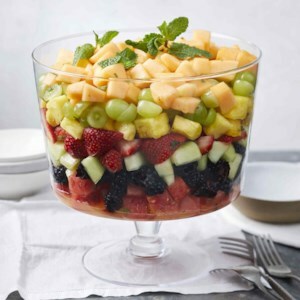 Layering colorful chopped fruits in a straight-sided trifle bowl gives a refreshing fruit salad a stunning presentation. It's a company-worthy brunch recipe and would also be a star at any potluck picnic. 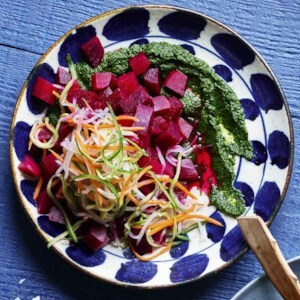 Quick-pickled beets are topped here with a namasu (a lightly pickled vegetable salad) made with carrot, cucumber and daikon radish. Recipes like this reflect the influence of Japanese immigrants who came to Hawaii to work on the sugar plantations in the 1800s. Recipe adapted from Chef Greg Harrison, Pacific'O Restaurant. 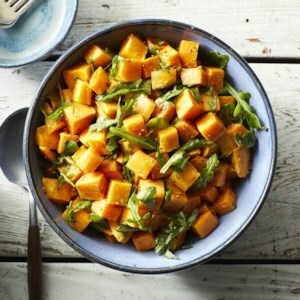 Yukon Gold and sweet potatoes create a beautiful color contrast in this chilled potato salad recipe. Try it for your next picnic or barbecue--the mustard-mayo dressing and sprinkling of chopped turkey bacon will guarantee you get plenty of requests for seconds. 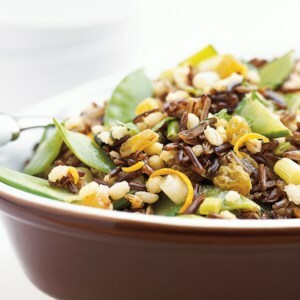 The addition of pea pods and raisins to rice and barley makes this crowd-pleasing salad extra nutritious. 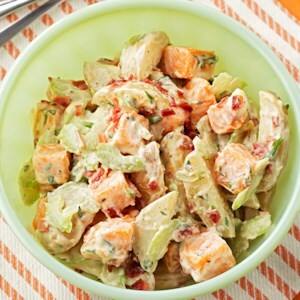 Chill for at least four hours to give the salad time to soak up the flavors of the low-fat orange dressing. 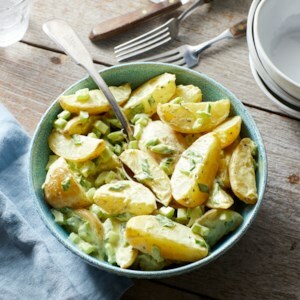 Most people think of potato salad as a cold side dish reserved for picnics or barbecues. Not this one! This hearty recipe pairs potatoes and onions in a slow cooker, where they cook until tender. Served warm and topped with chunks of cooked turkey bacon, this easy side dish is lovely served on a bed of baby spinach. 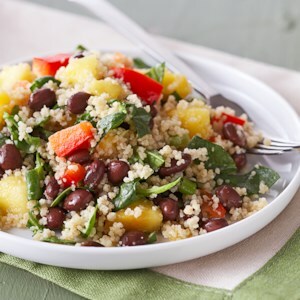 Mango, bell peppers, and black beans combine with whole-wheat couscous in this Caribbean-inspired grain salad. 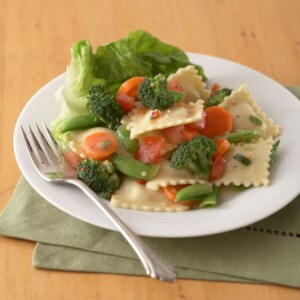 The ginger-lime dressing has a touch of cayenne pepper and provides just the right amount of zing! Lentils are ideal for cooking in the slow cooker. 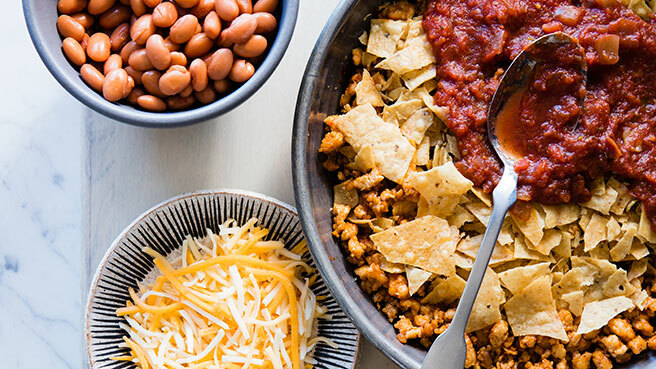 Start this recipe early in the morning and you and your family will be rewarded with a deliciously warm Mexican-inspired taco salad for dinner. 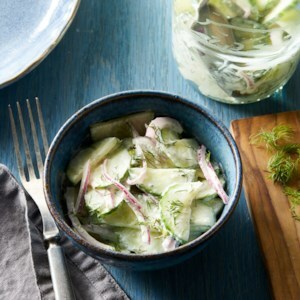 This creamy, refreshing cucumber salad is an easy side dish for any summer BBQ. Bright dill and white-wine vinegar add fresh tartness to cucumbers and red onions. 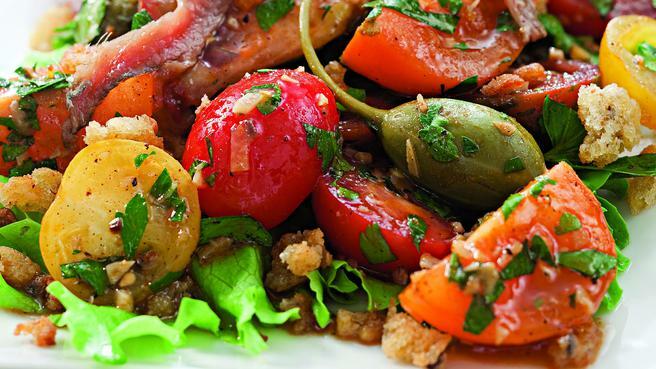 Enjoy this salad the day you prepare it so the ingredients don't turn watery. 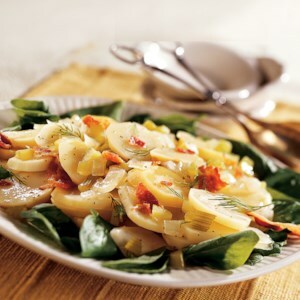 Give traditional potato salad a fresh spin with sweet potatoes, peppery arugula and a tangy-sweet dressing. This crowd-pleasing side dish is also versatile; you can add ingredients you prefer in potato salad, like bacon or green onions. Enjoy at room temperature or chilled. 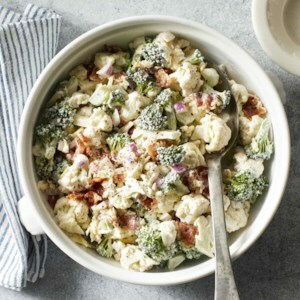 This creamy broccoli and cauliflower salad has a fabulous crunch. 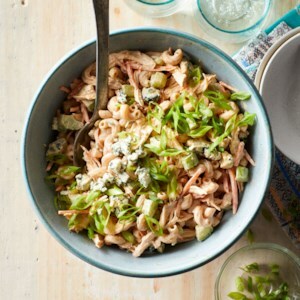 The salad holds well and is perfect for potlucks and picnics. 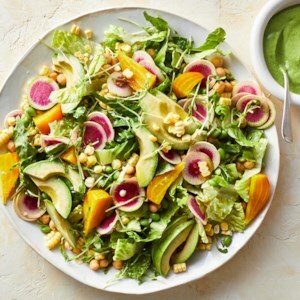 Our version has considerably less sugar than most Amish salad recipes and is lighter because we use a mixture of low-fat Greek yogurt and mayonnaise for the dressing. This egg-free version of the summertime staple is so creamy no one will ever guess it's vegan. Tossing the potatoes with dressing while they are still warm helps them absorb the flavors. Serve at room temperature or chilled. 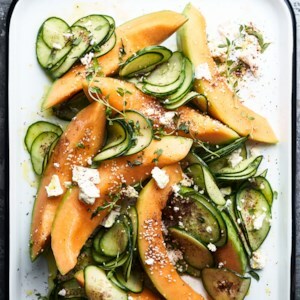 This juicy melon salad is seasoned with fresh oregano and thyme, sumac spice and toasted sesame seeds for a bright summertime take on the Middle Eastern spice blend za'atar. 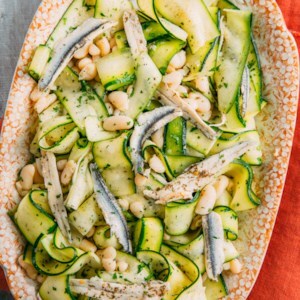 This simple but delicious five-ingredient salad highlights a number of elements beloved in the Occitanie region of France--white beans, olive oil, zucchini and anchovies. Use your best olive oil here, as it's essential to the flavor. 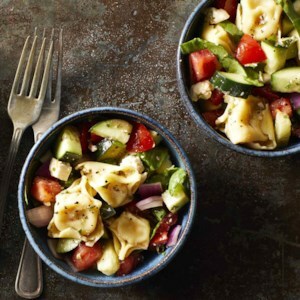 You'll need a sharp vegetable peeler to make the zucchini ribbons. Serve as a side dish next to roast chicken or grilled steak, or double the salad and enjoy as an entree with a warm baguette. 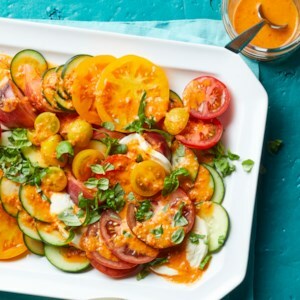 For this fast salad recipe, we top summer's ripest tomatoes with a bold tomato-based dressing for good measure. 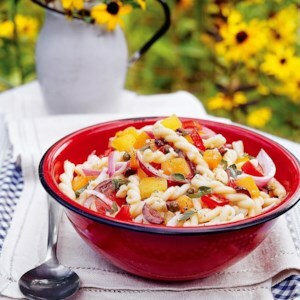 Serve as a light lunch with whole-grain toast or pair with grilled steak and chicken for dinner.